Mt St Helens just had its 37th anniversary this week since its eruption on May 18, 1980. There are several different places to photograph wildflowers on Mount St Helens, which offer completely different views of the mountain, and wildflowers. Depending on time and area, wildflowers generally start to bloom in early July and make their way to different parts of the park throughout the month. Access to the different locations of Mount St Helens for wildflowers can be cumbersome and difficult at times. Make sure to bring a map and research routes to get to your destination. To find out more information about when the flowers are blooming I often call the visitor center at the Johnston Ridge Observatory to get up to date reports of the wildflower status. Depending on which direction you come from will determine which highway you take to get to the flower destination. What is unique about Mount St Helens is that each side offers a different perspective of the landscape. As mentioned, flowers bloom at different times depending on the elevation and which side of the mountain. In this article, I have listed some of my favorite areas and hiking trails to visit on Mt St Helens for wildflowers. I have also included at the end of the article some tips I have found helpful when photographing at Mt St Helens. If you are looking to find the best flowers with the best view of the mountain, Johnston Ridge Observatory area will be your best bet. There are many trails and viewpoints from this area with the mountain and flowers together. In this particular area, the best flowers with the mountain are right in front of the visitor center. The collections of wildflowers that can be found are Indian paintbrush, penstemon, and lupine just to name a few. Make sure to explore around the area for at least a couple hours to find the best composition. I encourage people to hike the trails to find unique compositions. Because this spot is photographed often, I really try to get creative with my compositions. Another great spot for finding huge layouts of flowers together is a pull out just before you reach the Johnson Ridge Observatory. What I like about this location is that you will find far fewer people, with a variety of different trails leading from the parking lot. With a multitude of different looks to the mountain with combinations of flowers. The first trail I recommend for wildflowers and views of the mountain is the Norway Pass trail. It can be found on the eastern side of the mountain. Not only do you get wildflowers at the top of this hike but you can also look straight down at Spirit Lake. Throughout the hike, the scenery is stunning all around. What makes this trail unique is the juxtaposition between the old and new when you reach the top. You will see evidence of the devastation in terms of the landscape and the regrowth in the flowers together. Another unique fact about the Norway pass trail is the bear grass that grows up on the top, which complements the background view of Spirit Lake and Mount Saint Helens. My tip for this trail is to stay after the sunset and capture the reflection of the twilight colors in the lake, which provides a soothing mood and unforgettable experience. The Windy Ridge trail will give you a completely different look of Mount St Helens. It is the closest you can get to the crater in terms of distance. The landscape is much different here than anywhere else on the mountain. I find it more barren. The combination of finding a set of wildflowers and the barren landscape together with the view of the mountain really tell a story. When I visit this area, my only goal is to find a solitary set of wildflowers surrounded by the stark landscape. From the Windy Ridge area, you have total access to the iconic surrounding mountains such as Mount Adams and Mount Rainier. Make sure to explore and take the different trails. To access the Windy Ridge you need to take the National Forest Road 99. One of the most underrated viewpoints of Mount Saint Helens is the Lahar Viewpoint. The Lahar Viewpoint offers views from the Southside of the volcano. The area often has the most wildflowers of anywhere on the mountain as the valley is carpeted with penstemon, lupine, and other wildflowers. When photographing in this area, I will use elements of the landscape to use in my composition. I often look for logs that are placed on the ground that point towards the mountain. When this is immersed with flowers it makes for a very impactful photo. Hiking around the Lahar Valley, you will often find solitude. Of the many times I visited, I have been alone. I have walked several miles from the main trailhead, all with great views in the spring of the flowers and the mountain. One of the areas I like to visit in the late afternoon if I have some time to relax is around the Coldwater Lake area. It’s not necessarily a great place for flowers but it’s a great place to walk around and get some exercise. If you get lucky you can capture the lake when it’s calm for the perfect reflection of the mountain. There are many elements of the landscape that make Mt St Helens unique. Items such as fallen logs, crevices, and deep valleys are part of the landscape that really helps tell a story about the mountain and its history. Try to include these elements, to enhance the image and give a sense of place. The variety of wildflowers and colors are amazing. A number of different colors is one of the first things that you will notice if you visit in July, besides the mountain. When photographing this amazing display of wildflowers it’s important to compose the image so the colors are balanced throughout. To be more specific, try to balance the warmer and cooler tones together so that not one side becomes heavier than the other in terms of color. I also try to get an even display of different flowers without one kind being too overwhelming. Because the colors have so much impact it’s important to be very mindful of how you compose these flowers in your image. It’s also important that the flowers lead into the mountain to create depth in your image as well as create a connection between the front of the image to the back of it. You will find at Mount St. Helens it will often be very windy, making it important to have a tripod. Make sure that you use a higher ISO and shutter speed to capture the detail in the flowers without movement. I will often photograph a series of different exposures at different ISO and shutter speeds. Making sure that I have an ample amount of images with wildflowers where there is detail and no movement. One of my favorite things to do at Mount St. Helens’ is to photograph the wildflowers at night with the Milky Way. The combination of photographing the Milky Way and wildflowers together has become very popular in the last few years. It is certainly a challenge to photograph both the wildflowers at night and the Milky Way but the reward can be fantastic. These are just a few of the areas and trails that make Mt St Helens a fantastic place to see and photograph wildflowers. Take the time this summer to really explore this mountain. You will not regret it! Autumn is my favorite time for photographing in the Pacific Northwest. 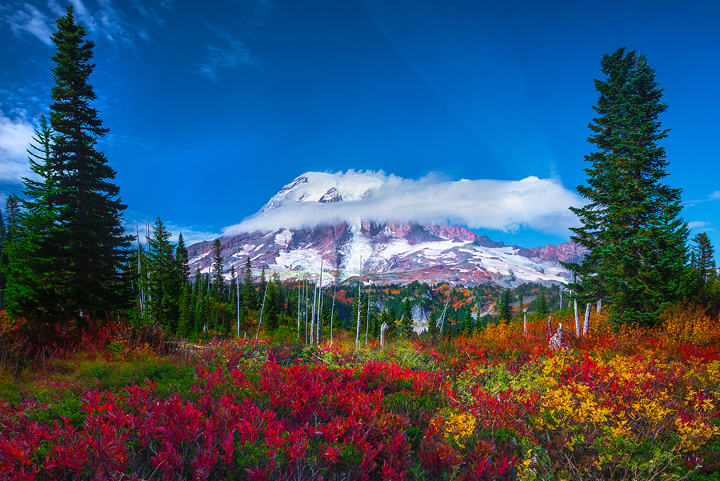 There are many places to capture fall colors, but nothing quite compares to photographing Mount Rainier in autumn. 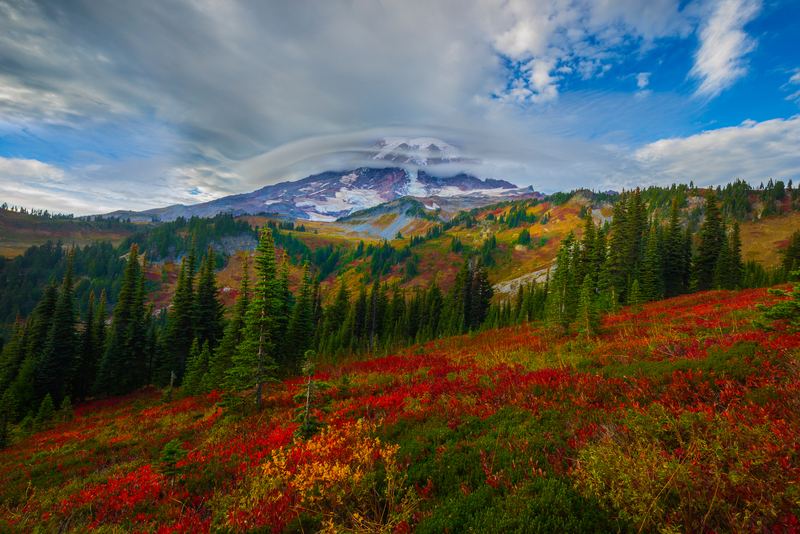 The Pacific Northwest and Mount Rainier make the perfect combination of elements needed for stunning images of fall photography. 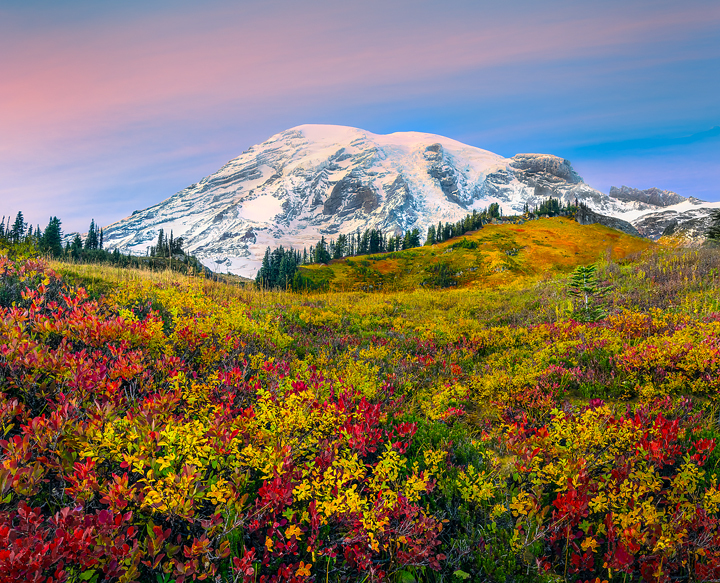 Not only is Mt Rainier known for its larger than life size, but also it picturesque lakes, waterfalls, meadows, and tundra. Although it varies year to year, I find the best time for fall colors is the last week of September to Mid-October. The color usually lasts until the first week of November when the snow first starts. Check fall reports on the Internet and the Mt Rainier website for more up to date information. 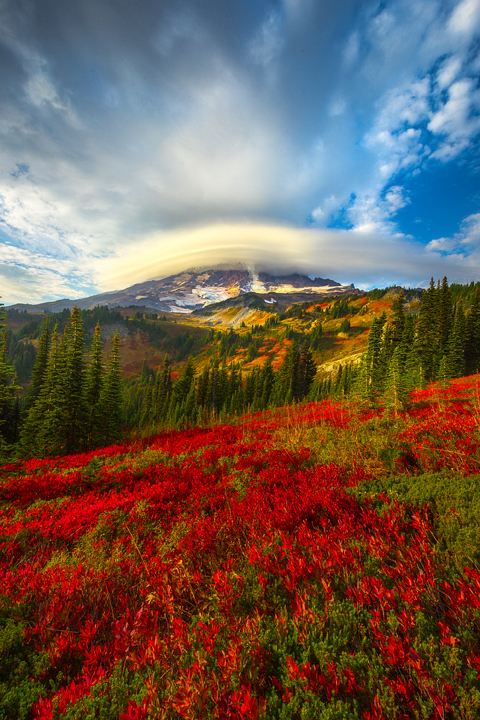 There are two main areas to visit when going to Mt Rainier, the Paradise and the Sunrise sides. Both have excellent fall color and a host of different aspects to photograph. In my experience, the fall colors start a few weeks earlier on the Sunrise side. 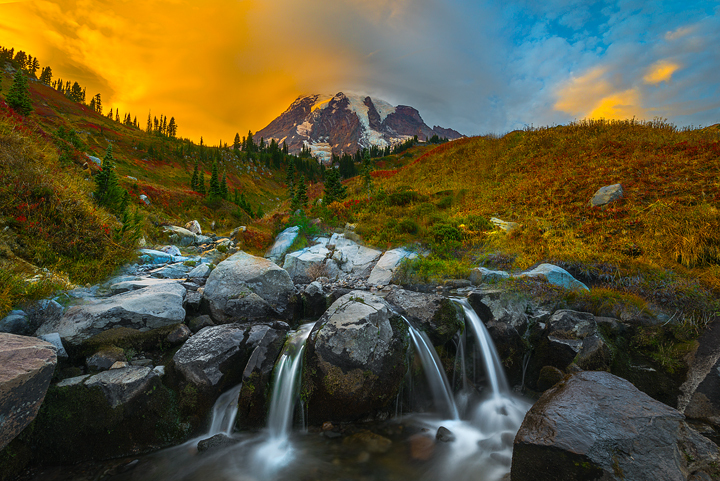 The best places to photograph on the Sunrise side are Yakima Peak, Emmons Glacier (Silver Forest Trail), and the Tipsoo Lake area. Take time to explore around Tipsoo Lake, especially the Naches Peak trail and both the Upper and Lower Tipsoo surrounding lakes. 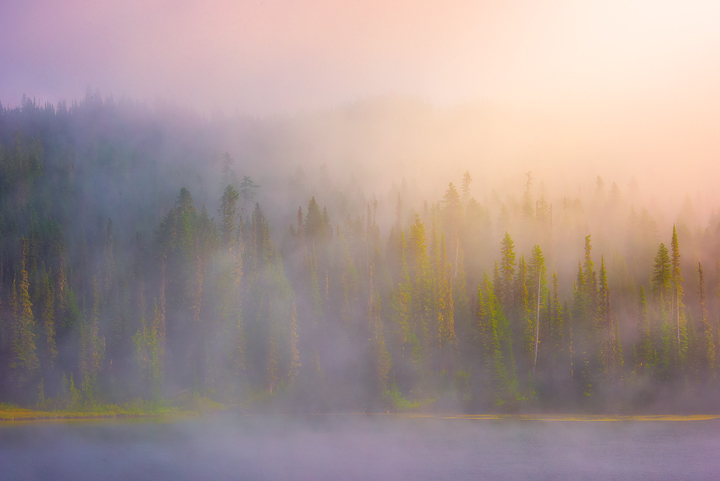 Early morning around Tipsoo Lake usually has a host of colors and mist that make for excellent atmospheric images. When photographing in late September the stunning sunrises make for great fall conditions. 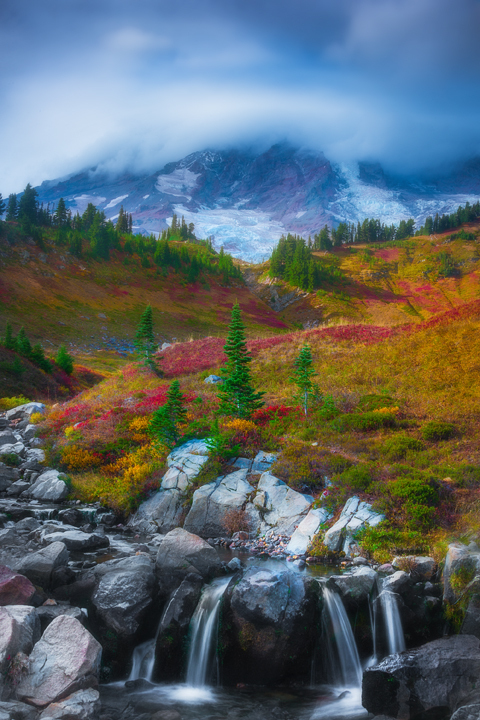 In terms of the foliage, red huckleberry and larch is what you can expect to find on Mt Rainer. The other types of foliage you see are cottonwoods, willows, elderberry, aspen, tamarack (western larch) and evergreen trees. 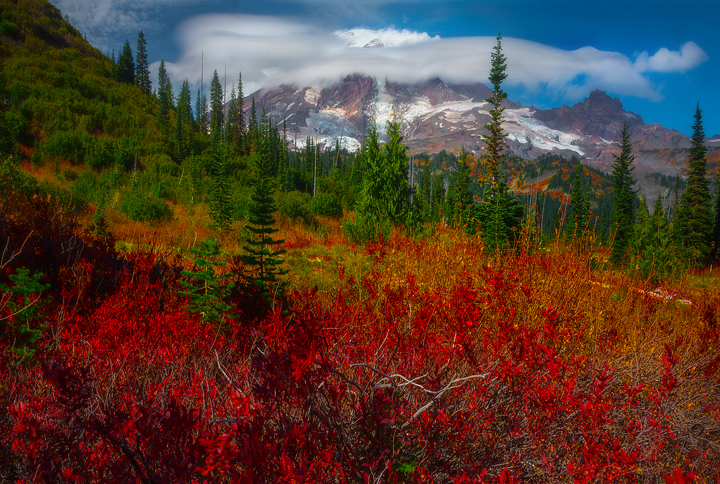 Although there are several types of foliage to shoot in autumn on Mt Rainier, my personal favorite is the Red Huckleberry. Visually, the red is very impactful and always sticks out above other fall foliage. When photographing try to incorporate the red huckleberry with areas of water like lakes and ponds. The reflection of the red foliage mirrored looks stunning. 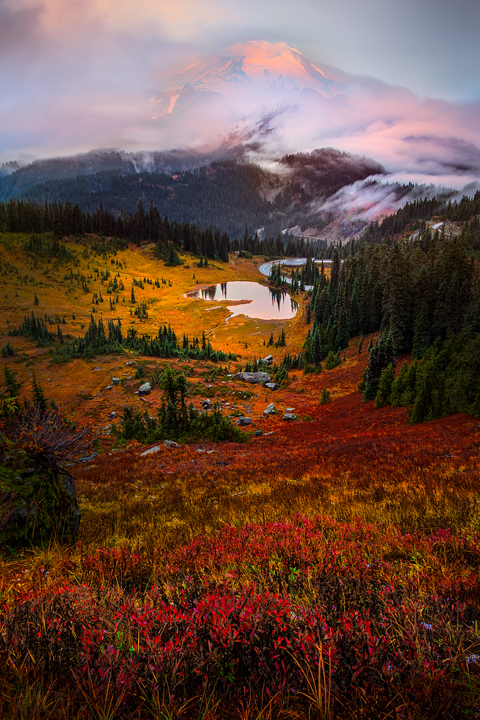 The first sign of fall color is the red huckleberry, followed by larches in the later stages of autumn.When it comes to photographing on the Paradise side of Mount Rainier I like to start off by looking for fall colors at the Paradise Inn. The area around the Inn has a great view of the mountain. The best displays of fall color right can be found right at the visitors center. 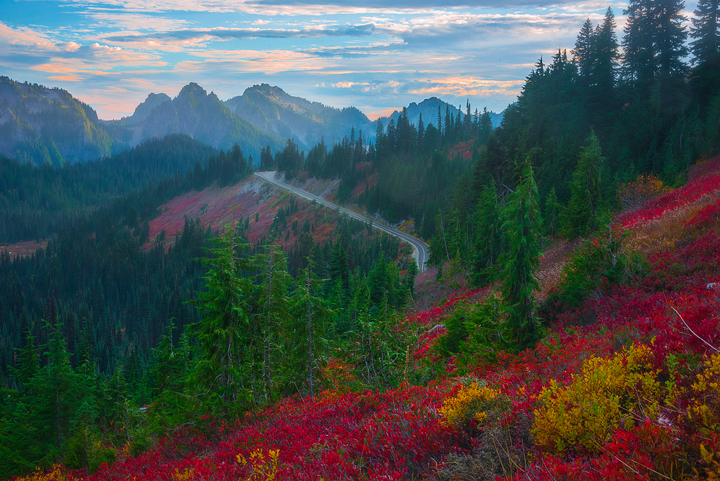 Heading up the pathway to Myrtle Falls, the fall colors and view of the mountain only get better. Try to incorporate waterfalls from the Paradise Side. Although the hike can be somewhat strenuous, the hike is worth it. If you keep along the path they converge into the Paradise Valley where the mountain is in full view. If you turn 180 degrees away from the mountain you get grand views of the Tatoosh range. The Tatoosh Range looks best at sunset. 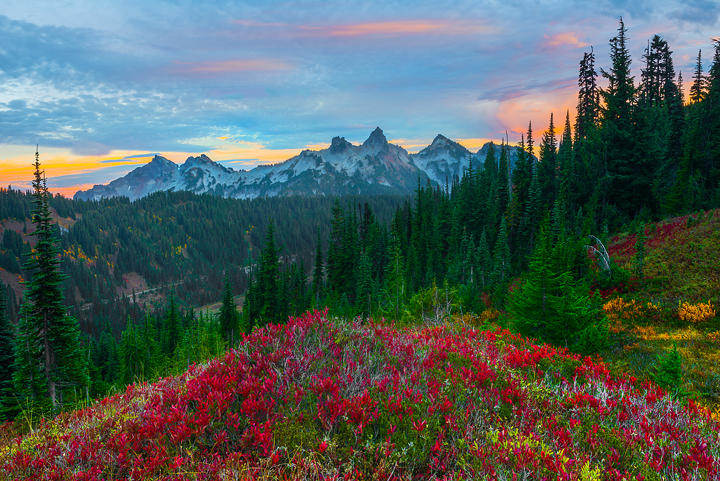 When the weather looks active and the clouds are moving in, the Paradise Meadows also makes a great sunset spot. 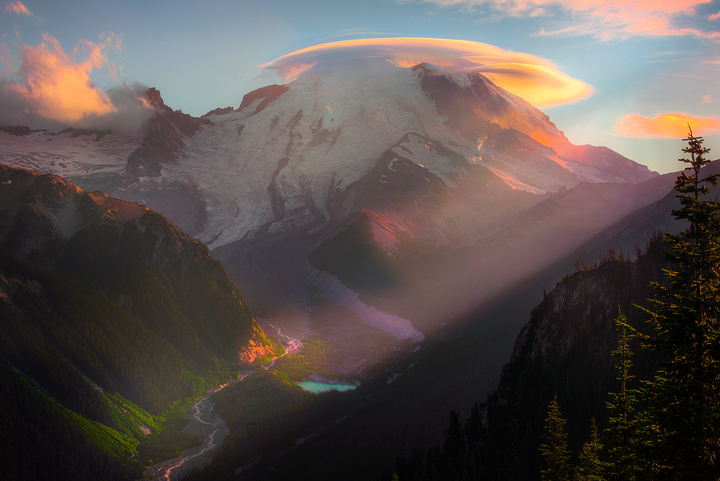 Sometimes the clouds block views of Mt Rainier. 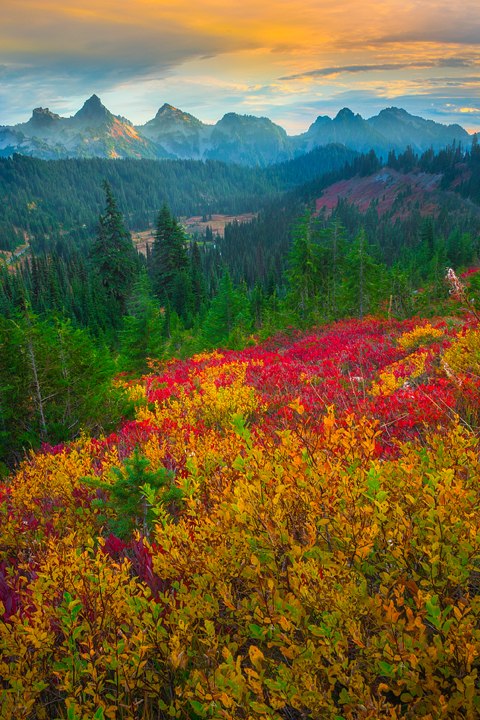 However, the colors on the Tatoosh Range look excellent. 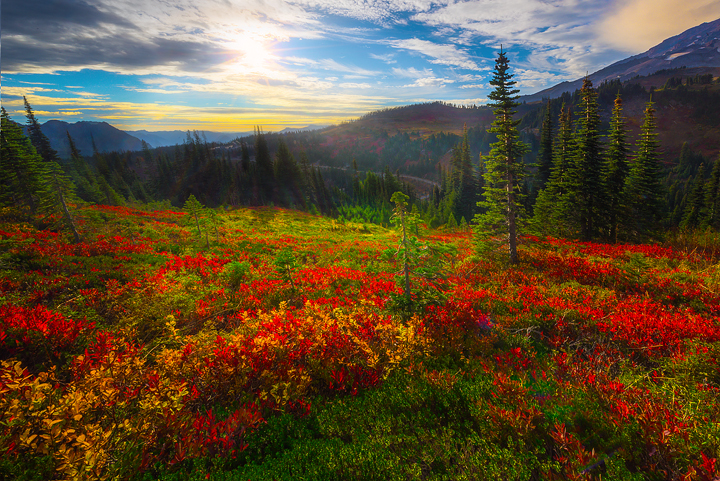 In essence, the Paradise Meadows is your safest bet if you are looking to capture some fall colors on the mountain. If you continue up the hill past Myrtle Falls, you will eventually reach the Mazama Ridge. It’s my favorite area to see the mountain and fall color. With wide-open meadows of vibrant color, and full views of the mountain it makes for an excellent combination. The total hike in and out from the Mazama Ridge is about 4 miles. 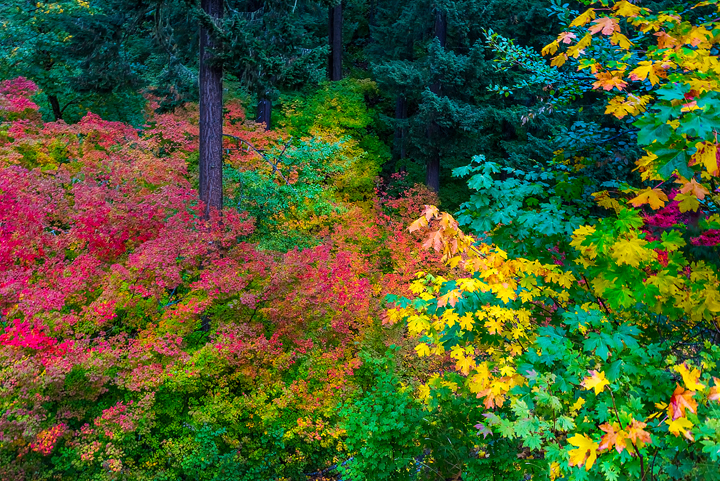 There are several areas to stop along the way to photograph fall colors. If you like to shoot reflection images of the mountain, you can’t do better than both the Reflection and Bench Lake areas. I always make an annual stop at these lakes early in the morning to capture both atmospheric mist and fall colors.The hikes around the lake also present many possibilities to shoot more intimate shots of autumn.If you are looking to capture images of fall color and forest scenes, then head into the Grove Of Patriarchs. Many short hikes in this forest provide stunning forest views of the tall trees and fall colors. To get really creative, try photographing really low to the ground and aim straight up with the camera. Look to combine both fall colors and evergreen trees together. 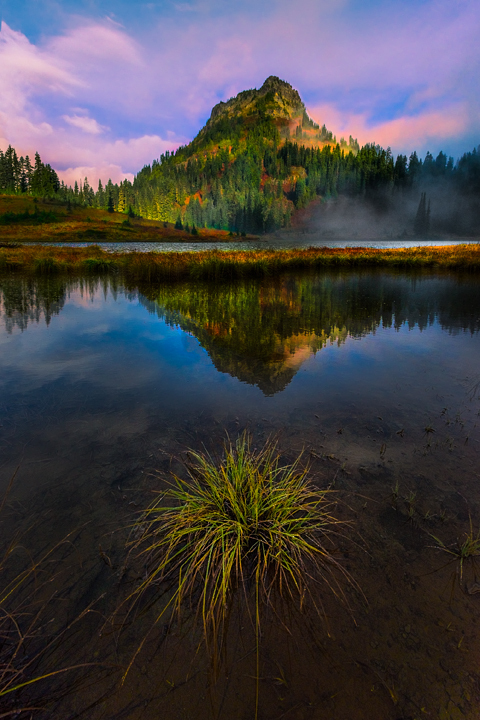 With so many places to photograph on Mt Rainier, you always have many options available. If you are lucky enough to live close to the mountain, September is a great time to watch the mountain for unusual weather activity. 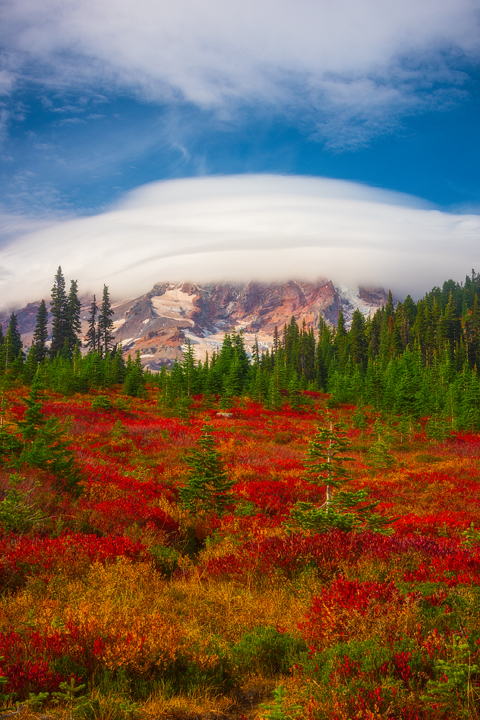 The elevation of Mt Rainier is so high it creates its own weather system. Therefore, your chances of seeing unusual weather patterns like lenticular cloud buildup is quite possible. In layman terms, lenticular clouds are those clouds that look like UFO’s in the sky. They are caused by encounters with obstructions in the sky like very high mountain peaks. Known also as “wave clouds” they make for very interesting patterns and when combined with fall colors make for ideal conditions. In autumn, I check the webcams quite often looking for a buildup of these clouds as it takes often several hours to develop. The Paradise Valley makes for one of the best spots to see this unique weather pattern. Another place that I will often see these weather patterns is along the Silver Forest Trail, which is about .5 of a mile from the parking lot at the Sunrise Visitor Center. 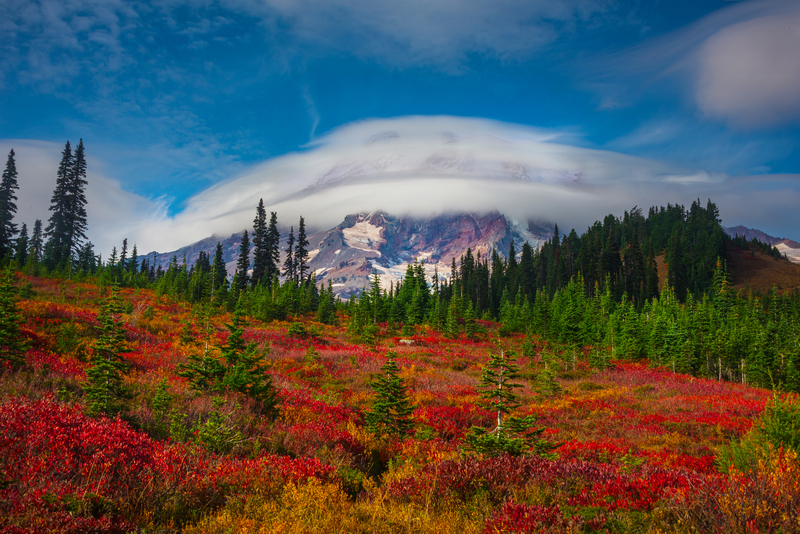 Combine all of the elements of unusual weather, stunning sunrises, and atmospheric conditions and Mt Rainier makes for the perfect autumn spot to photograph. I recently got the chance to co-host a Photo Walk in Vancouver, BC, Canada with 500px. We also had the luck to have Fuji as a sponsor for the event and to have a representative from Fuji join us. About 80 people participated in the Photo Walk. There were lots of Fiji giveaways and everybody walked away some goodies including a lucky participant that won an underwater camera. For those that were wondering what exactly a Photo Walk is. Here is the short answer; it’s an organized photo event that brings photographers together from all walks of life with a common interest in taking pictures. There are many benefits to joining a Photo Walk in your local area. It gets photographers together with like-minded goals. It introduces you to the events and organizations that are in your area that have to do with photography. Also, it gives you the chance to meet all kinds of people with diverse backgrounds that, when together, share ideas and thoughts. The Photo Walks often take place in an area of the city that really highlight the area’s beauty. It’s a great way to see your city as well learn new things. For this Photo Walk I choose the Vancouver Seawall in Stanley Park as the place to meet the group of photographers and really showcase Vancouver’s stunning city skyline views. Vancouver is well known around the world for its tall buildings and gorgeous harbor views of the city. The Vancouver Seawall is just a short walk from the main downtown area, yet allows one to feel like you are far enough away from the city to really enjoy it without the crowds. The group started at the historic Vancouver Rowing Club and worked its way around the seawall shooting all different perspectives of the city skyline. Right away we encountered a great spot for photographing fall colors. Some people got adventurous and laid on the grass and took turns photographing the fall leaves. The photo below is an example. The shooting of the fall colors gave the group a great chance talk about the potential of an important concept in nature photography called High Dynamic Range or HDR. 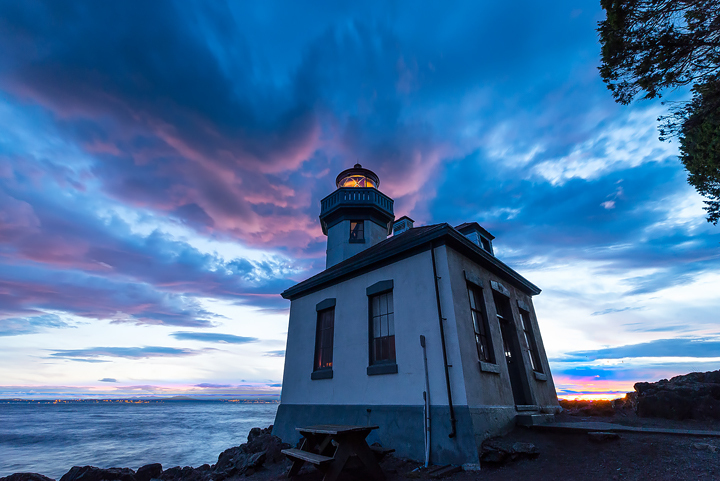 High Dynamic Photography is the process of taking multiple exposures of the same scene with different exposures and combining them into one exposure. The final exposure is made up of all the exposures and thus has a wider dynamic range of exposure in a single image. Some had done it before and others were learning about it for the first time. People also shared some of their tricks when shooting, as for example, when shooting into the sun at an aperture of f/22. After finishing shooting the fall colors and trees along the seawall the group moved on to shoot the inner harbor and city skyline. Everyone was eager to learn all about the different ways to shoot the city as well as learn about their camera settings to take advantage of the light. We choose a time to photograph near sunset to show of the late light of twilight on the cityscape as shown in the examples below. We were also fortunate enough to get a near full moon that gave the group more opportunities to shoot late into the night. The group made its way along the seawall noting some of the local wildlife such as the harbor seals. People also took time to talk about photo equipment and what cameras and lenses to use and in what situations to use them. With a wide diversity of cameras and tripods the group tried out several different pieces of equipment including some newer lenses by Fuji. The Vancouver Seawall is also in my opinion one of the best places to shoot panoramas of the city with reflections. So the group got together and did some panoramas that worked out great with the light and the location. The scenes below show examples of panoramas. The sun began to set in the west and the last of the day’s light hit the Vancouver landscape city skyline. This gave the group an opportunity to shoot a group photo of some of the participants, which people can share. We managed to all squeeze close enough with the backdrop of Vancouver. Eventually we made our way back to the start of the Photo Walk continuing to photograph the city at night with all its glorious reflections in the water. The group even found a way to shoot at night without a tripod by placing the camera on the seawall ledge, which made for a great impromptu tripod. During the few hours together we got to know each other and made new friends. We also learnt lots of new things about Vancouver and photography. The night ended with people exchanging contact information and well as the promise to post their images on their Facebook page. Co-hosting the event with 500px gave me a great opportunity to learn some new things as well as meet a great bunch of new people. It was amazing to see how many people showed up from different experiences yet shared a common goal of taking great photos. So thank you everyone who showed up and hope to see everyone again in the near future. And thanks to our sponsor, Fuji and 500px for co-hosting the event. For the last five years I’ve taken spring trips down to the Californian Redwoods. Each year I take the trip with the hope of photographing the stunning rhododendrons with the fog and mist that occurs frequently in spring and summer. The last few years I have either been too early or too late. I have witnessed some stunning weather conditions in terms of fog and mist, which produced stunning crepuscular rays but no flowers. From past experiences it seemed to always occur in late morning light as the fog would rise and the sun breaks through. This year I had the fortunate luck to have some fellow Photo Cascadia members teach a workshop down in the Redwoods a week earlier. They reported the rhododendrons we’re just about at peak and if I were to head down right away I would be arriving at the perfect time. So I packed up my bags and convinced the wife when needed a getaway. With some begging and pleading we headed down to California. 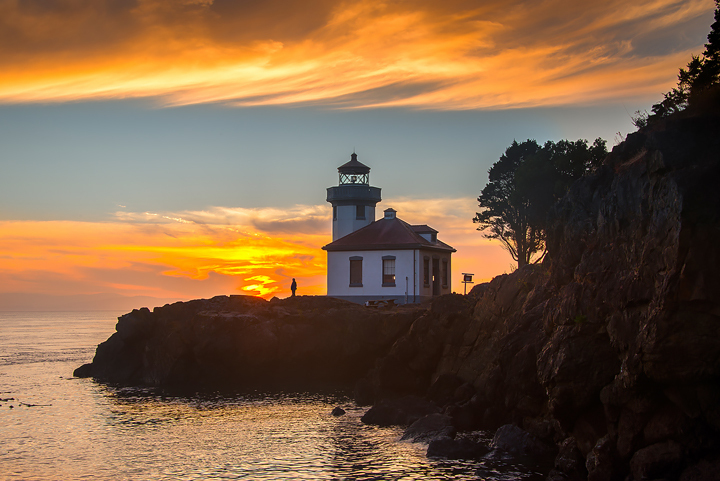 As usual, we made a few stops along the southern Oregon coast and made the most out of the trip. In terms of weather reports I usually scout out a week early to see if the conditions are favorable but this this time I had to just head straight down there with no delays. The last four years I’ve seen crepuscular rays almost every day I’ve ever visited the redwoods in spring. So now all I needed to do was find a pleasing composition with both the fog and the rhododendrons, and possibly a burst of sunrays to top things off. If you have never been to the California redwoods it is an oasis of larger-than-life trees. Knowing where to photograph if you’ve never been or not done your research beforehand can be very challenging. With the Redwoods being as large as they are, it helps to know the best trails to capture all of the elements in one scene. The redwoods are broken into several areas that are quite spaced apart. Although similar to each other, each has its own distinct look when it comes to the layout. Every year it changes quite drastically in terms of where the rhododendrons are best for photographing. For my visit, the first thing I did was go to the visitor center and seek advice. They were very helpful in suggesting several trails that were excellent at the time. They also advised me in terms of where to be and when tin terms of placement of the breaking sun and fog. Although I saw several sets of rhododendrons along the main highway in Del Norte Coast Redwoods State Park, I would suggest not stopping along the highway as the cars came to close to the side to comfortably photograph. As in past years, I was recommended to hike the Damnation trail, which had several stunning areas of rhododendrons with the trails not being too busy with other people. To avoid crowds I suggest getting there first thing in the morning. Going early allows time to find a pleasing composition while waiting for the light to be just right. On a side note, many cars early in the morning were broken into in the parking areas as the highway is right there and is quick access for the thieves. On both mornings I was there cars have been broken into before I got there. When it comes photographing, the rhododendrons in the California redwoods it helps to pre-visualize some possible compositions or scenarios you would like to shoot. I never visit a place with just one composition in mind, but I do research on the Internet beforehand. This allows me the opportunity to see what others are doing, and trying to take it on step further in terms of creativity and impact. For example, one of the images that stuck with me, was an image of the rhododendrons taken from the ground looking up at sky to also include perspective of the gigantic Redwood trees. The combination of these two together when photographed properly really brings a story to life. When light is available I always strive for mist or fog because this seems to really enhance the pink in the rhododendron flower and makes it pop in the image. Shooting later in the afternoon when the sun is out can be almost next to impossible to really get the impact of the color due to the harsh light. So to maximize the color in your images strive to photograph when the mist is present in the morning. One of the challenges of shooting the rhododendrons is that many are located very high up on the tree. For this reason I would photograph with a lens that is medium telephoto. When I photographed with my ultra wide angle (14-24mm), the rhododendrons got lost in the scene. So I photographed with a 28– 300mm lens that allowed me to really bring the rhododendron in tight and maximize impact. Because of the telephoto lens, compression also enhanced the important elements in the image. 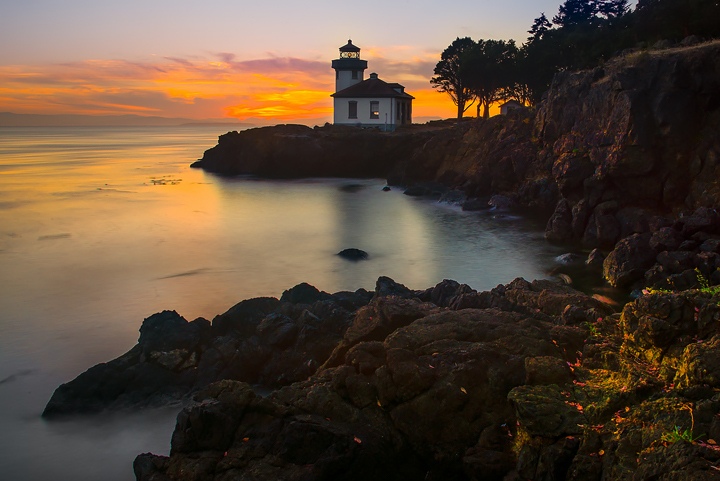 If you do shoot later in the afternoon when the sun is out, you will have to shoot multiple exposures or HDR. This is due to the extreme total contrast between the shadows and the light areas, which can be very challenging in the forest. I did shoot quite a bit in the afternoon, using multiple exposures. Unfortunately I was not happy with most of the results from shooting at this time. So in summary, photographing the California redwoods is one of the highlights of my photography journey. Until you see them in person, it’s hard to grasp how tall these trees really are. When you combine these tall redwoods with all the elements at the same time it is pure heaven. To have success photographing the redwoods do your research, find where the rhododendrons are and try to time your visit with early morning sessions. But the most important thing is ,be patient and wait for early-morning weather changes when the fog rises and the sun breaks. This is more frequent than you would think, always leads to some spectacular images. 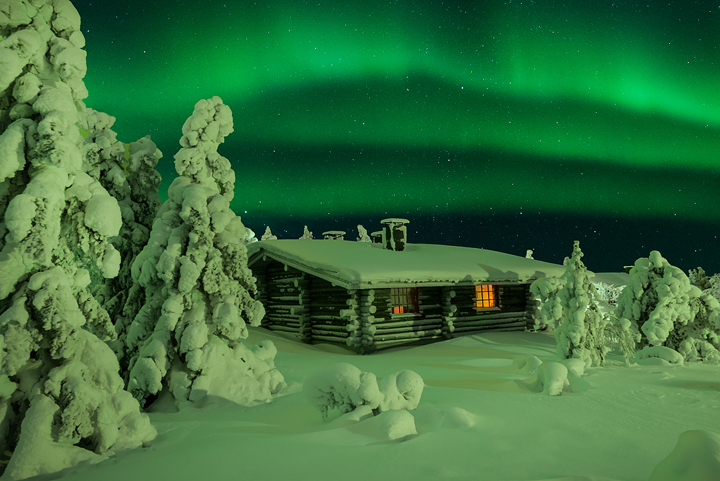 One of my dreams has always been to photograph the Northern lights under a fresh blanket of white snow. A few years I got a chance to photograph the northern lights in the Canadian Rockies. I happened to be on a workshop at Abraham Lake shooting winter landscapes when we received an unexpected stunning display of lights. At this point I had no experience and was not sure even how to do it; all I knew was the photography mantra, “expose to the right always”. So I made the mistake of shooting the northern lights for thirty seconds or more to get the scene exposure on the right side of my histogram. During my moments of excitement and panic I did not even think to look at the images just the histogram. I learned a hard less on that night as the final result was a series of images that had all been overexposed. This overexposure caused all the Northern lights to blend together with no detail or patterns. A lot has happened since then in term of camera equipment technology and photographer progress. 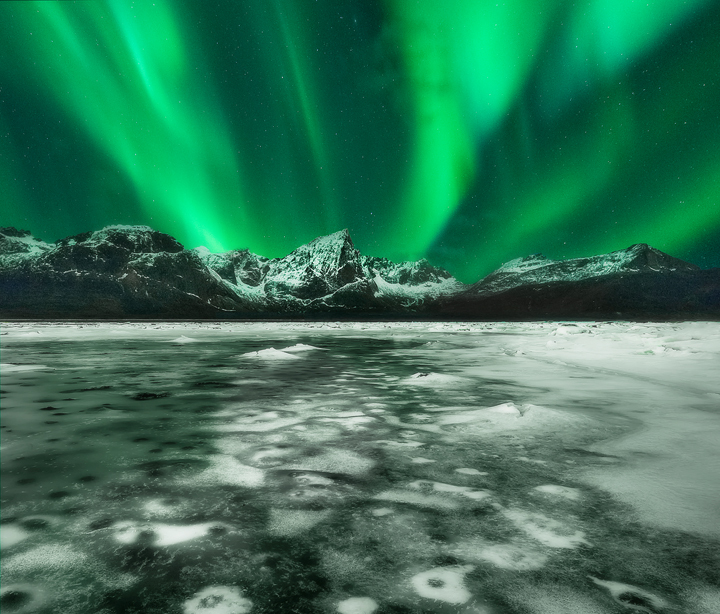 These days with the year 2014 being a great year for Northern Lights I thought I would write a brief article on my experience and what I have learned. 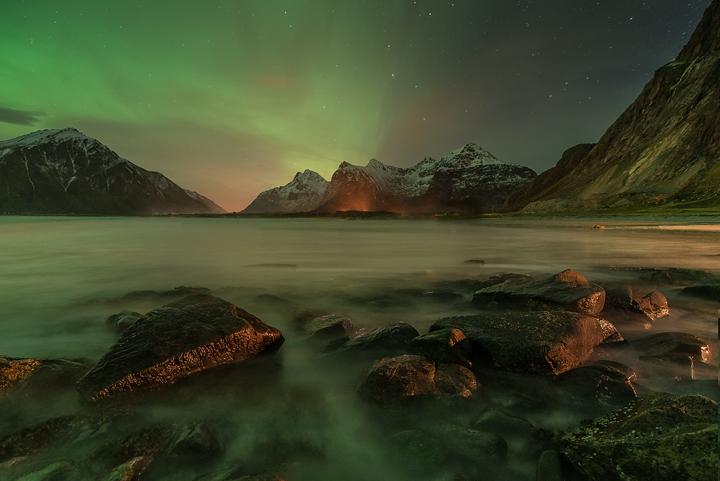 When it comes to locations and where to find the right places to shoot the Northern Lights it always comes down to a few places that always win the hearts of photographers when it comes to visual beauty. As most know the Northern Lights are called that for a reason and that being they are seen in the higher areas of the Northern Hemisphere. The areas that I find the truly most scenic are Iceland, Norway/Scandinavia, Alaska, and Canada/Yukon. Each has its plus and minuses which are beyond the scope of the article. This year has been predicted to be a fantastic year for Northern Lights so I decided to do plan several trips this year based around the Northern lights. For my first trip I visited the countries of Sweden, Finland, Norway, and more specifically the Lofoten Islands. I had never been there and had seen all the images with fresh snow and snow capped mountain peaks. It was exactly what I had been looking for. From research I knew driving would be extremely difficult in the Lofoten Islands so I decided to take a photo tour where I would not have to worry about that. If you have ever photographed with me you know that was a smart decision. It was nice to be able to just be taken to places without worrying if I would end up lost and frozen somewhere in the night. Some nights it was -28 and a few seconds in this temperature and you felt the numbness already. The other advantage of taking a photo tour is the instructors will know the best places to go when the Northern Lights do happen. The last thing you want to be doing is trying to find a place when the lights occur. Not only was this advantageous to have instructors take you to these places but they also have the knowledge to know where it is most likely to happen and when. This was really helpful at night so that you did not have to stay up all night to look out the window when you have already been shooting all day. So how are you suppose to shoot Northern Lights? Well the following is just my experience with it and what I found works best. The first thing I want to talk about is shutter speed and how long you should expose for the image. This depends on the light available at each scene and the elements. The most important aspect I found to be essential to shooting lights is to make sure you don’t overexpose. What I found works best to capture detail in the Northern Lights is anywhere from five to twelve seconds. Anymore then this and the lights just blur into one another and you lose the stunning movements of the lights. I adjust the shutter speed based on how fast the lights are moving. When you get high action movement in the lights adjust your settings to have a shutter speed of five seconds. 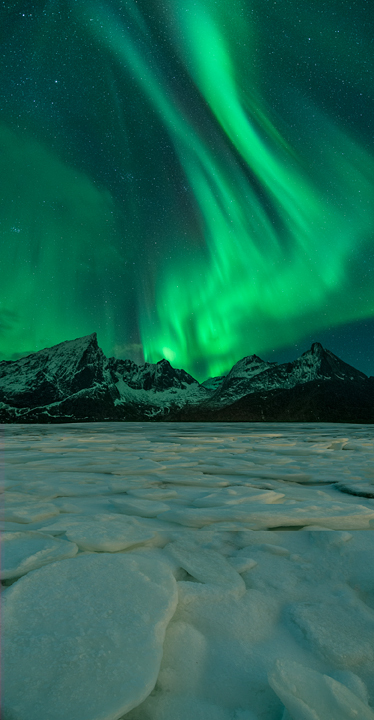 This short shutter speed will allow you to capture all the stunning patterns and movement of the Northern Lights. When the lights are barely visible I was up around twelve seconds. So in terms of my ISO I adjusted it so that I would be able to get the proper shutter speed. 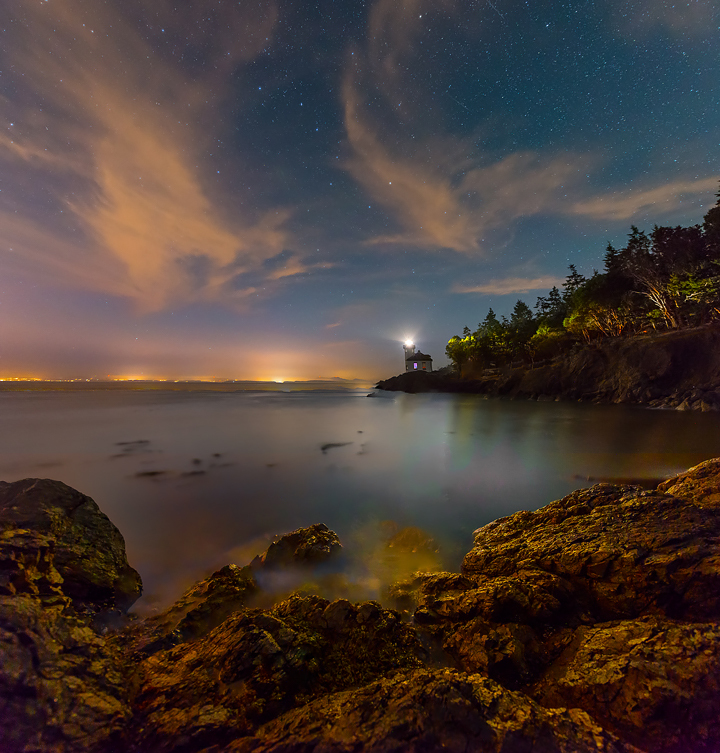 I photograph with a Nikon D800 with a 14-24/2.8 lens so that camera and lens does really well with night photography. I found that most of my images were taken at ISO 1600 and a few at ISO 3200 for the short bursts of light. In hindsight most of the images that I took at ISO 3200 were too noisy for large printing. It goes without saying that newer cameras will do better with noise and low light situations. I also recommend using a lens that has an aperture of 2.8 or less. Shooting at f/4 lens I was not able to shoot the lights with minimal noise and fast enough shutter speed. If possible a 1.4 or 1.8 would be even more preferable. In terms of what type of lens to shoot in terms of length, I always look for something as wide as possible. Using a 14mm lens I was able to capture most of the patterns in one image. 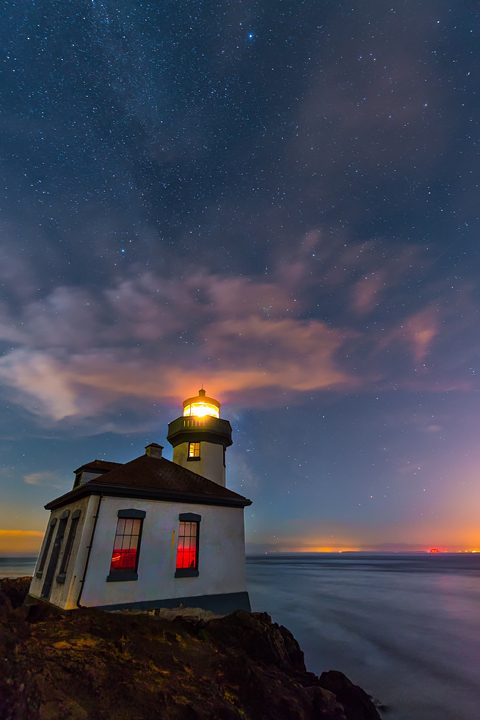 I have seen plenty of fantastic images with a fish-eye lens as well. So what happens to the rest of the elements in the image when shooting specifically for the Northern Lights? Well when shooting just for the lights the rest of the elements went completely dark and no detail. This meant I had to do another exposure just for the rest of the scene and manually blend the two images together in post processing. It is vital that you use a strong tripod with a sturdy ballhead to prevent any kind of movement during the shot especially when shooting on the ice. 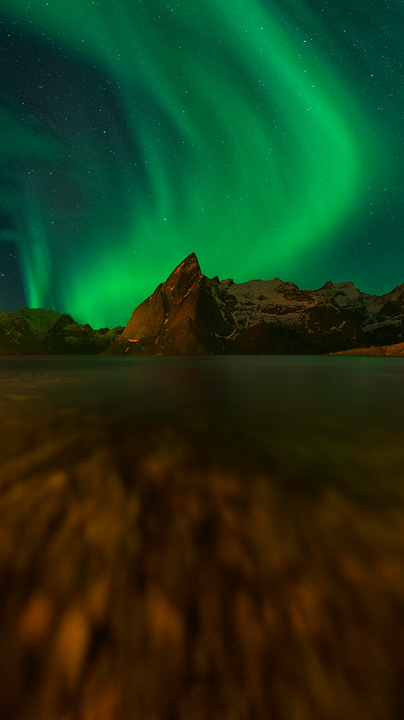 The first night of shooting Northern Lights we visited a frozen lake surrounded by mountain peaks. The creativity of shooting Northern Lights has been getting better so fast, that the most creative images most always include the foreground with the Northern Lights. So being that I was on a frozen lake I looked for ice cracks that would act as great leading lines that would connect the foreground to the background lights. 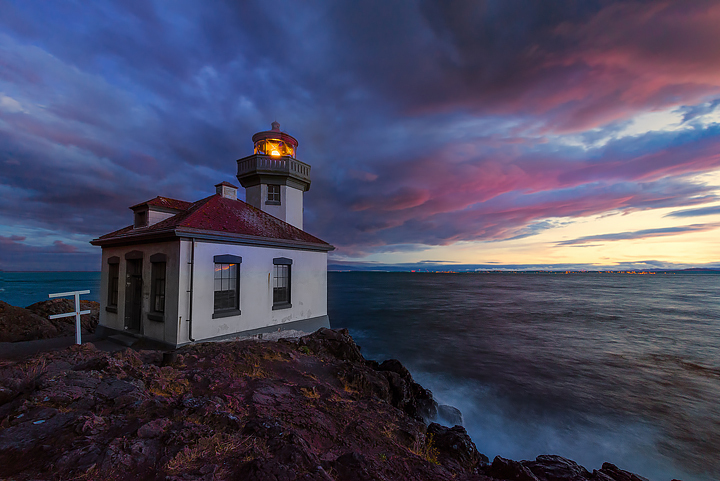 To properly expose the complete scene you need to take at least two images. One image should expose for the Northern Lights; a second image where you expose for the foreground and the other elements in the image. A critical element to exposure in the foreground is the elements present. If there is plenty of snow especially in the foreground your exposure will be much less. After the images are taken I usually shoot another image with my hand in front of the lens to signify the end of the series of images. Later in Adobe Lightroom or Adobe Bridge I can stack those images as the same set or series. This is very helpful later on when trying to sort what image goes with what. So I shot the Northern lights at ISO 1600 for nine second and then exposed for the foreground ice, which was anywhere from thirty to sixty seconds. I then manually blended the two in Photoshop. 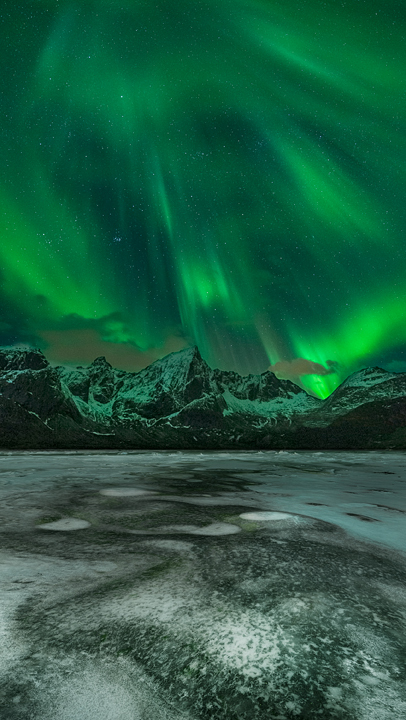 The next component to photographing Northern Lights successfully is Aperture and focusing. Aperture is a constant from my experience. I need to be at an aperture f/2.8 (lower if I had a faster lens) always to get a fast enough shutter speed to capture the patterns in the Northern Lights. Combining an aperture of f/2.8 and ISO 1600 allowed me to achieve a shutter speed of less then ten seconds. The trickiest part for me was the focusing. I started by focusing on the background first to make sure I got the Northern Lights in focus. I set this up by looking at my LCD live and focusing on a star in the distant sky. I then go in at 100% preview by pushing the plus button till I got a bright star in tight and rotated the focus till it was sharp. Once that has occurred you can shoot the background Northern Lights with the assurance you have those sharp. Double check after by checking the LCD review of the image and going in again at 100% to see all the stars are sharp. You know you are in the right area if you are focusing on infinity and then pulling back a smidge from that. If that all seems like too much work you can practice test shots during the day and marking on your lens where the background is in focus and use that mark on the lens later when shooting Northern lights. There are other ways that people use to focus on background stars but I found these methods worked best for me. Once you are confident the background Northern Lights are sharp, refocus for the foreground without moving the tripod or the camera position. If you are going to later blend the two images together in post processing there can be no movement in the camera. In my experience this was the hardest part in the process. I tried a couple of images where I shot one image focusing only on the background but all my foreground elements would be soft. So I would say it is imperative to refocus for a second shot. Once I got the hang of that process I took it one step further and took several images focus bracketing at several different increments blending all the images in post processing. So how do you focus in the foreground when everything is in complete darkness? The answer is bringing some sort of light like a LED light or your headlamp. Find an object in the immediate foreground you will want to include in the image and then focus on that. Use the LCD preview and again go in at 100% to make sure everything is sharp. There are many ways that people offer when it comes to focusing on subjects in the foreground but for me I chose the most important element of the foreground I wanted and used that. That works well except if you are in a group or a workshop where everyone is photographing as well. Shooting with several other participants in the workshop in a wide open space with head lamps buzzing everywhere lead to contamination of light in most of my images. Even though people are spread out, any kind of light that people use can show up in your images. No matter how far away I seemed to get away from the group I could see other photographers flashlights in my images. So be wary if in a group situation. 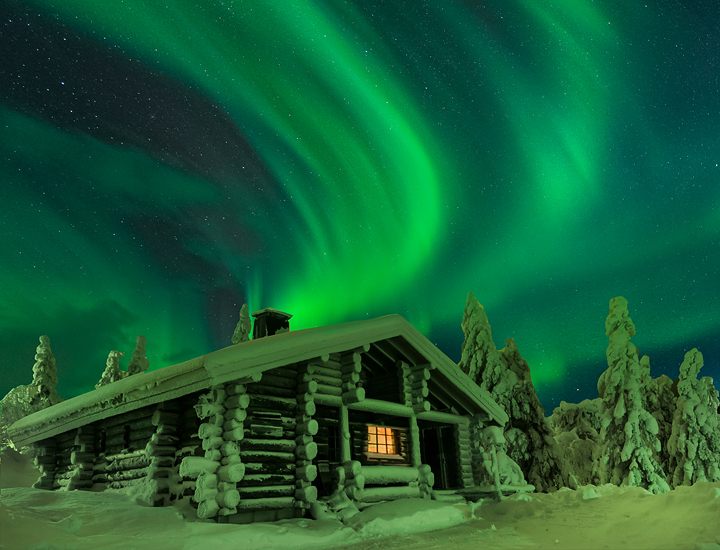 This can be very hard to overcome when shooting Northern Lights. Thus, I tried to avoid using any light and use my best estimate. This proved to be a big mistake and I lost several images to the foreground being soft. So to overcome this obstacle I decided I needed to wait till the next day. 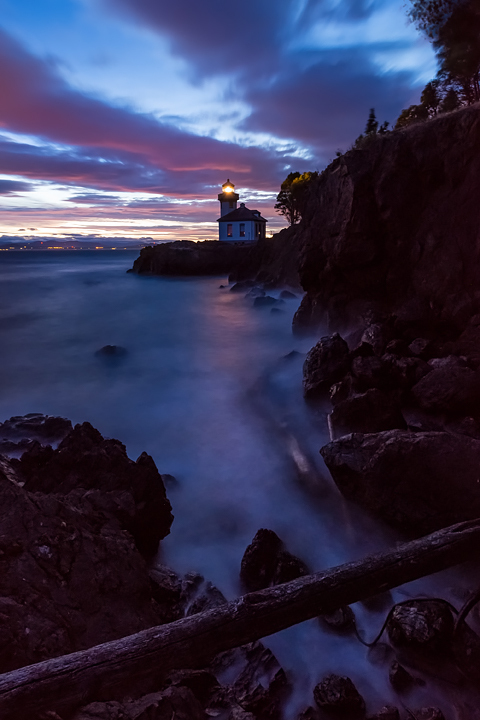 I would practice during the daylight and mark my lens where the optimal sharpness point should be; choosing to focus on something one-third into the foreground scene. When testing I looked for a similar situation that I would find myself in while shooting the Northern Lights. I was looking for something where the foreground element would be similar such as a rock, ice crack, etc. This foreground subject would be right in front of me with the mountain peaks in the far background. Once I found the spot of optimal sharpness I marked this on my lens. I could then go straight to that focus point next time I was in the dark and shooting Northern Lights in a group situation. I want to note this was not the ideal situation and the focus was not always a 100% but it was the best I could do under the situation. The last thing I did was take some time to just enjoy the Northern Lights without doing any shooting. Just enjoy the amazing show that so few people every get to see! If you have any tips that you found helpful that would be great to know..